Acro dance classes at Pembroke School of Performing Arts seamlessly blend dance and acrobatics. 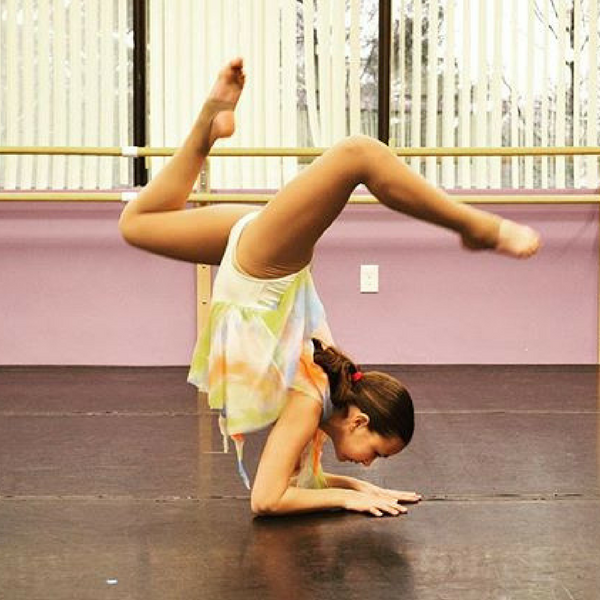 Students practice fundamental acrobatic techniques and skills such as handstands, cartwheels, back bends, walkovers chin stands, elbow stands, balance, and contortion tricks depending on individual level of experience. Advance acro classes involve advanced techniques such as diving walkovers, front aerials, and side aerials. Click the class name for dance class descriptions, requirements, tuition rates, and to register. Acro students study continuously all year long, meeting on various days and times. Class length varies from 45 minutes to two hours in length, depending on the level and age. Acro Classes can be added to Ballet, Tap, Jazz & Modern combo classes at an additional cost. Class time is focused on technique Sept through February. We begin our performance choreography in March, combining skills mastered and perfected in the earlier classes into our choreography, showcasing our dancer’s growth. Intermediate and Advanced Acro classes require proper placement prior to registration. Please check with us prior to registering for these classes to ensure your child gets registered in the proper class. Parents are free to view their child’s class each week or when their schedule allows. All students are required to wear class leotards along with stirrup tights as assigned to their class. We have partnered with Curtain Call and Capezio to provide an easy way to buy all of your class wear needs. Simply go to http://www.curtaincallforclass.com/login and you’ll be asked for our studio’s passphrase. Tuition is due the first of each month or parents may select a quarterly payment schedule.